Fuerteventura is the second largest island in the Canaries, situated only 100km from the coast of Africa. Its proximity to the continent allows the island to benefit from a dry climate and guaranteed year-round sunshine, making it the perfect holiday destination for sun-seekers. Regarded as the jewel of the Canary Islands, Fuerteventura boasts 340km of emerald coastline with vast stretches of white, sandy beaches. You'll always be able to find your own secluded spot of paradise if you're looking for a relaxing getaway. There is plenty of breath-taking scenery on Fuerteventura. Achieving its status as a World Biosphere Reserve in 2009, the island has been recognised for its impressive volcanic landscape which is home to a rich variety of plants and wildlife. Corralejo Natural Park in the north of the island offers 9km of idyllic beaches, small coves and untouched sand dunes to explore. Further north, a short boat ride transports you to the tranquil isle of Lobos and the serene La Concha beach where it is possible to spot birds and fauna unique to the island. 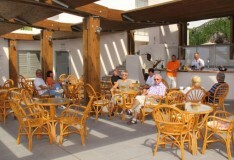 Both of these areas of natural beauty are located close to the popular beachside resort of Corralejo. Once a small fishing village, Corralejo has expanded into a lively resort that has managed to retain some of its traditional charm, with a variety of seafood restaurants and charming streets close to the harbour. The nearby beaches are a mecca for holidaymakers and are the ideal place to relax in the sun. If you wish to visit more of Fuerteventura's rich history, travel inland to the towns of Antigua and Betancuria Old Town. Immerse yourself in these towns' cultural legacies, filled with traditional architecture and museums which transport you back in time to the island's industrial and artistic heritage. In the gentle landscape surrounding Antigua, you will find the area dotted with picturesque windmills providing the island with a unique character. Food-lovers must try Fuerteventura's famous goat's cheese. Visit the dairies just outside Betancuria to try this local delicacy that is popular across the Canaries. 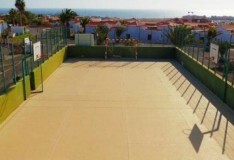 Alternatively, if you are looking for a holiday perfect for all the family the resort of Caleta de Fuste will keep everyone entertained. Surrounded by gentle beaches, this colourful resort hosts an excellent range of shops, bars, restaurants that line the seafront. For the more active travellers, you can tee up on one of the nearby golf courses or enjoy one of the many water-based activities the island is renowned for. The resort is also conveniently located close to the island's airport if you are looking for a straightforward and stress-free trip. While there is no shortage of stunning beaches on Fuerteventura, the south of the island arguably provides some of the best. On the southern peninsula, the beaches of Playa de Cofete and Costa Calma beach stretch for miles along the island's coastline, surrounding the volcanic peaks of Jandia Natural Park. Take a stroll along the gentle sands and you are guaranteed to find a private area of beach to enjoy the sun. Make the most of this incredible location by staying in the vibrant resort of Costa Calma which has an excellent range of bars and restaurants to try. Book affordable holidays to Fuerteventura with Mercury Holidays and explore this charming Spanish island. Whether you are looking for a short break or longer winter sun stay, Fuerteventura holidays offer something for you. With our cheap holiday deals, which include 3rd week FREE offers, you will find the perfect holiday on this stunning island in the Canaries whatever your budget.